standard 9 x 12 inches. Are you looking for a personalized gift for a family member or friend who has a Dog or Cat? Prints with a Past is pleased to offer a service where we can mat or frame a picture of your pet with an English cigarette card featuring the breed. An example of this presentation is shown to the left. 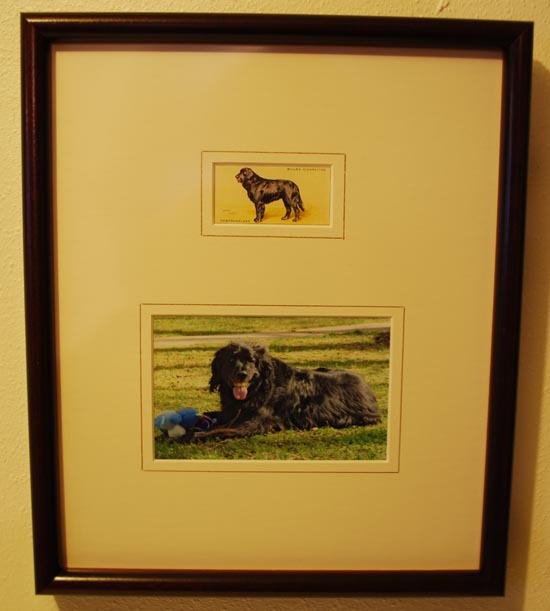 This print was prepared for a client and his 14-year old Newfoundland named Nikki. Note: For Dogs, if you don't see the breed you are interested in, let us know. We have other Dog cigarette card series available. If you want us to frame the print, click here to review the available moulding styles. Send a file containing the digital photo (JPG format) of the Dog or Cat to us via Email (printsinfo@printspast.com), along with your Name and phone number. If you do not have a digital photo, you can mail us an existing photo and we scan it for you. The original will be returned with the matted print. We will contact you to finalize the details for the order. If you have any questions, please send an Email or give us a call at 1-800-239-5506 (001-509-443-2201 outside of the US/Canada). Note: Shipping rates are for clients in the United States. International rates will be quoted on request.